Throwback Thursday - Welcome to NBA JAM — GamingWithSwag.com - Dads By Day, Gamers By Night. I'm not a huge sports fan--never have been, likely won't be anytime soon. It's strange, because when I watch a game, I become emotionally invested; I pick my team, root for them, and more often than not, watch them lose. (Editor’s Note- CJ chooses the underdog as a rule which explains the repeated loss viewings) In fact, as a youth, I rooted for the Buffalo Bills at the Super Bowl, not just once, not just twice, but four times. Since then, I've always kept sports fandom at arms' length, really only engaging in any sort of sports conversation when it engaged popular culture, and in the 1990's, Basketball intersected with the general pop culture zeitgeist often. The NBA rose to the "extreme attitude" of the decade with bad boy Dennis Rodman; it garnered pop-culture curiosity through the mythic status of the giant Shaquille O'Neal, and it brought constant attention to the game through the ubiquitous presence of Michael Jordan across a wide array of endorsement partners. Each of these players garnered so much interest from the general public that they got lead roles in films (Double Team, Space Jam, and Shazaam, respectively). As popular as these players were, however, I don’t know if anything brought more general interest to the NBA as the much-praised video game, NBA JAM. 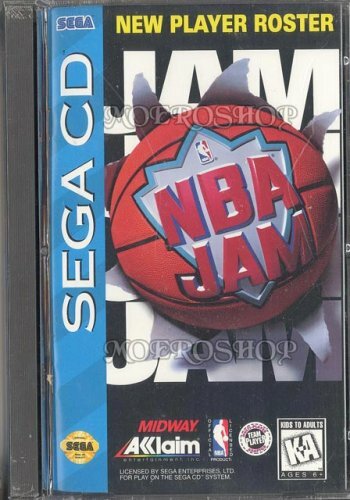 A given gamer picking up NBA JAM may not ever sit through a full basketball game, but after playing this cartridge for two weeks, he could likely name 1-2 players (if not 3) from half of the NBA. Yes, the game was that addictive (and popular). Recently, Chris let me borrow his Genesis and a copy of this the Tournament Edition release. As we all know, I was a Nintendo kid, so I had no experience with the Sega version, so it sat untouched in a stack of carts by my TV until the following weekend when my Father-in-law visited. Then things got crazy. In as much as I had consistently spoken well of this title in conversation, I had forgotten just how fun this game was. The gameplay is simple enough, offering shoot, turbo, and pass buttons on offense that change to jump, turbo, and steal on defense. The game runs for four 3-minute quarters and features a 24-second shot clock, as well as a record-keeping feature based on one's initials. The Player stats visible in the selection menu allow the gamer to choose the strengths on which he wants to focus his gameplay and strategy. The Sega version offers 5 difficulty levels and a variety of other options for controls and gameplay (I don't recall all the features on SNES). Of course, the selling point on NBA JAM is not the basic ease of gameplay but the cartoonish fun of the running commentary and the ridiculous dunking. Players in NBA JAM don't merely shoot and score; they flip, spin, and literally light the net on fire with the power of their talent. It's not realistic, but it is entertaining. My only qualm with the game: after every match you have to return to the menu, re-input your initials, and select your team again (of course, I could be doing it wrong). I'm guessing this is a direct holdover from arcade play, but it is a bit of nuisance having to go through that before every single game. What about you? Did you have a favorite basketball game from the 16-bit consoles? Were you an NCAA guy? Arch Rivals fan? Or did you skip the b-ball altogether in favor of Shaq-Fu? Editor’s Note – The Orlando Magic were the best with the Utah Jazz in second place, unless you played as the hidden characters Bill and Hillary Clinton. Imagine how good NBA Jam would have been if Michael Jordan and Shaq allowed themselves to be in the game.